Stadium comes first, and then comes the team. Opened in 2005, Allianz Arena has turned into a legendary battlefield hosting FC Bayern Munich. The stadium depicts club’s glorious history and is the home of 75,000 of its dedicated supporters. The idea of building a new stadium for FC Bayern Munich appeared in 1997. The new stadium was supposed to replace old Olympiastadion. However, the new stadium opened its doors to 75,000 fans only in 2005. Since that time, it was a home pitch for the leading Bundes Liga team as well as its tenant Munich 1860. Allianz Arena represents the modern state of art featuring an unusual shape that resulted in its nickname “The Inflatable Boat”. The moniker speaks for itself featuring Bayern Munich numerous trophies and wins on the European arena. The stadium constantly breaks the attendance records highlighting 100% capacity over the last few years. Categories 1 and 2 include Premium seats located on the lower and upper long-side tiers. Categories 3 and 4 occupy upper and lower short-side tiers featuring seats for away visitors and local supporters. Category 5 seats are the lowest row on the short-side tier from both sides right behind the net. Category 6 seats are for VIP visitors including business lounges and seats for special guests. NOTE: Keep in mind that Cat 3 and 4 seats include the standing area while Category 6 seats are unavailable for both casual visitors and club members. As a rule, tickets are sold out for the entire season. You are recommended to book them in advance. As it was mentioned before, Allianz Arena tickets are sold out for the entire season. The stadium boasts record capacity among other leading European clubs. For the last 5 years, 100% of seats are sold out despite over the average ticket prices. Luckily for you, StubHub platform will never let you miss the match of your favs. It boasts an intuitive interface making it easy to choose a sea and pay for it online with just a click. Category 5 ticket price €15. Also, note that the price may change in case of major matches taking place. They may include final European legs as well as Champions League playoffs or DFB-Pokal finals. Finding a good place to stay near the stadium can be a challenge. This is due to a bad location of the arena. Allianz Arena is situated on the edge of the city. However, Booking.com will appear to be your essential helper when it comes to finding a suitable hotel to stay for a night whether you travel on your own or with family and friends. We have found some good variants for you to save your time and book a room beforehand considering enormous crowds, especially on the matchday. Arena Stadt München – thanks to a great location and available bus stops and U-Bahn stations nearby, it will take you about 15 minutes to get to the center of Munich as well as about 10 minutes to reach the Allianz Arena. You can also find parks, museums, and galleries located in the borough. The price includes free Wi-Fi and breakfast. One night will cost you $160 for a double room. Hotel Lechnerhof – it is a good place to relax from the stadium crowd after the match or a long tourist walk around the city. The private hotel is located in the peaceful area and features classic German-style architecture. Guests can use the local spa, gym, sauna, and solarium. They are not included in the price unlike breakfast, which is free. A double room with all necessary facilities will cost you $192 per night. BEST WESTERN Hotel The K – the hotel is located in the Bavaria Region Unterföhring. It is not far from the stadium. According to the latest reviews, the property boasts the best value considering spacious rooms with Flat TVs and satellite channels. In addition, guests can wind down in the on-site bar with an outdoor terrace. One night here will cost you $132 including very good breakfasts. Super 8 Munich City North – unlike other options form our list. This one is situated in the North right next to the Kieferngarten U-Bahn station. It will take you several minutes to get to the stadium and about 10 minutes to reach the downtown. The hotel is surrounded by picturesque parks and green areas. One night in a standard double room will cost you $118. It is yet the cheapest offer on our list. Allianz Arena is located comparatively not far from the downtown (about 10 km). It will take about 15 minutes to get to the stadium from the city center. On the other hand, the stadium is situated on the edge of Munich reserving a few places of interest to see and visit. 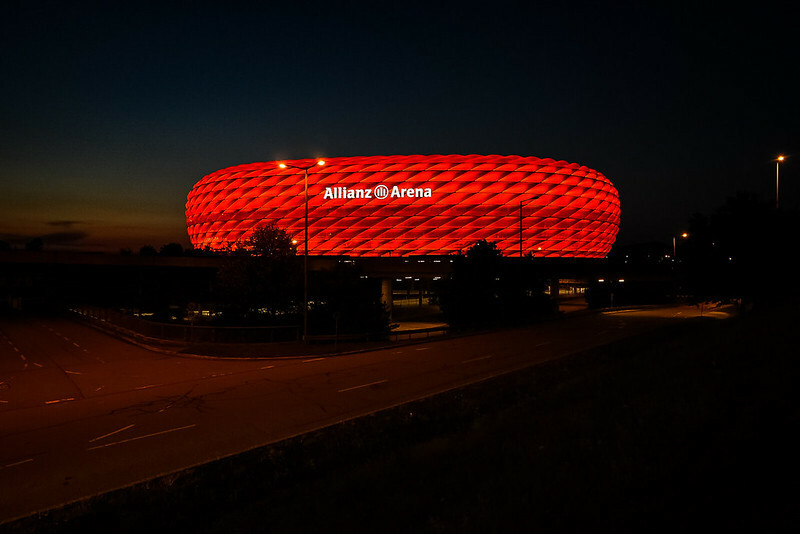 Surrounded mainly by parks and green areas, Allianz Arena offers several ways to get. At the same time, Munich boasts its developed U-Bahn metro station network linked to bus stops. The system makes it very easy to get to any destination and saves much time. You may not even need your car taking into account the accessibility of public transport. Nevertheless, we highlighted all possible ways for visitors to reach Allianz Arena as fast as possible despite traffic jams. By Tube – Frottmaning is the nearest metro station to Allianz Arena. It is located on the U6 underground line and can be easily accessible from the downtown. You may take Marienplatz station and get directly to the Arena. By Bus – Munich boasts a very convenient public transport network. Apart from the metro, busses appear to be another easy way to get o the arena on the ground. The bus stops are located next to the metro stations. In other words, you actually follow the same underground line on top of it. Take a bust from Marienplatz and get off near Frottmaning. Then you will have to walk for about 10 minutes to get to the stadium. By Car – if you travel by car from the airport, you will need to head along the A92 and then switch it into the A9. Vice versa in case you travel from the North. Do not miss the A99 and then follow the road signs. By Taxi – Taxi in Munich is expensive. You will have to pay about €30 for a 15-minute trip from the city center to the stadium while a trip from the airport will cost you €60 or even more. By Plane – once you have landed at the Franz-Josef-Strauss, you have several options to get to the city center. The first one is to take the Lufthansa Airport Bus. The second one is to take the S1 or S8 S-Bahn trains that will take you directly to the downtown. Allianz Arena’s visitors can enjoy a large number of convenient services. Car parking is among those things but the amount of the spots is never enough. However, there is always a solution. The approximate matchday paid parking price near the sports venue in Munich is €9. Despite the stadium location with a few places to see and visit with the exception of the match, the borough still has some good venues to eat out. Munich is rich with different bistros and cafes in addition to traditional Bavarian pubs serving a wide selection of German beers. Finding a good place to have a meal or snack can be daunting. For this reason, we decided to put an ease on your search and conducted a list of top bars and restaurants to eat out near Allianz Arena. Cafe Sportsbar Arena – what can be better than to start the matchday in a traditional German pub. The venue hosts most dedicated supporters and offers a selection of snacks and beers you can enjoy on the outside terrace. If it is rainy outside, visitors will appreciate the neon bar with an array of drinks to get warm. Biergarten – a truly beer garden it is! A good spot to have a snack or two with friends and enjoy local classic burgers with over 20 selections of local and foreign beers available on tap. The venue is pretty small. So, make sure to come in advance before the match to grab some free seats. Rick´s Café – a nice café to spend time with family. Here you can listen to live music as well as try some of the local desserts. Your kids will certainly love them while you are enjoying your burger and beer. Flamms Cafe Bar & Restaurant – looking for a place to have a snack? The venue serves an amazing selection of pizzas and other meals for adults and kids. Here you will find a rich collection of wines in addition to a peaceful atmosphere where you can wind down in tranquility. Café Blücher | Bar-Restaurant – decorated with fresh tulips and other flowers, this venue welcomes guests of any age. The menu includes some popular dishes from the European cuisine as well as some local meals you would love. Allianz Arena is not just a football stadium. The place delivers a bunch of facilities and entertainments out of the box. From exclusive matchday tours to shops, restaurants and the official FC Bayern Munich museum – here you can find plenty of great things to see, try and hear. You can check other prices on the official stadium tour page. FC Bayern Munich museum is the real godsend for those who want to dive deep into the history of the glorious team. You will follow the path for the clubs foundation that took place at the Café Gisela to the latest trophies and awards ever won. You will learn more about legendary players; view some historical photos and team’s highlights. Here you can also order catering and throw a party for your friends or relatives. Children 0-5 years old – free entry. For more visitors’ information, go to the official museum page. The official Bayern Munich fan store is a huge marketplace with an enormous selection of sportswear, accessories, training kits and souvenirs for all tastes. An intuitive interface lets you easily choose a jersey or cleats by your favorite player. Apart from football wear, visitors can choose from basketball official clothing as well as take part in auctions or benefit from special offers and discounts. While being the third biggest city in Germany, Munich offers plenty of interesting things to experience. From bathing in Art Nouveau temples and exploring the city’s renewed architecture after its reconstruction to sausages and beer tasting – everyone will find the entertainment to like. The Bavarian capital has something more than the BMW factory. It is a real Pandora box for those who like to try new authentic cuisine or dive deep into the experimental culinary. Check our list of best things to see in Munich and explore the city at full swing. Bus sightseeing tours are the best way to observe all major places of interest. They are flexible and cheap letting you organize your time before and after the match. The price starts from £ 13.81. You can choose any gap between 9:00 am to 5:30 pm, while the buses depart every 20 minutes. You will have a chance to see the Odeonsplatz square, Alte Pinakothek art museum house, Hauptbahnhof railway station, and more attractions. Marienplatz – it is one of the most beautiful squares in Munich featuring a combination of several architectural styles reflected in cathedrals. It should be mentioned that Munich was bombed severely. However, local authorities managed to give the city a new boost of energy after its reconstruction and renewal. The square looks as beautiful as many decades ago. Altes Hackerhaus – the venue is the city’s main signature when it comes to sausages and a selection of German beers. The restaurant is so popular with tourists that it immediately became Munich major attraction. English Garden – despite being the industrial center, Munich has many gardens to walk and breathe in fresh air. The English Garden is one of the most scenic areas. It certainly worth visiting to walk around the ponds and green alleys. A good place for recreation.